In a recent post, I discussed the combative rhetoric of transhumanists, and concluded that their resentment is directed not so much against critics, but against their own human nature. Given how widespread this resentment is, I think it would be worthwhile to start chronicling it. Found on [XXXXX]’s Facebook.... [XXXXX is a member of the board of directors of the] Methuselah Foundation. Towards whom is this "bold gesture" directed? It doesn't seem to be anyone in particular. Again, [XXXXX] seems to literally be giving the finger to his own human nature. Beyond the strangeness of that self-loathing, the transhumanists bizarrely seem to be personifying human nature itself in order to antagonize it. POSTSCRIPT (January 14, 2013): The image above has been altered to block out the face of the man flipping the bird. The original image appeared in a post by Michael Anissimov, which has since been removed, but you can still find it in the Internet Archive. We have now altered the picture to obscure the man's face and edited the post to remove his name, since he says that he was not responsible for the picture (he says his face was photoshopped in) or the words. Although it seems that he endorsed the picture and sentiment at least halfheartedly — he either posted it on Facebook or left it up there for some time after someone else did — we are happy to take it down at his request. 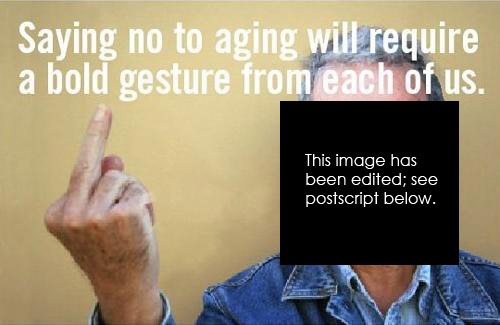 @The Boss: Yes, [XXXXX] is, as you say, giving “aging the finger.” But as I noted a while back, giving the finger to aging means giving the finger to something written into our very nature. [XXXXX] is giving the finger not to some abstract enemy called “aging,” but to an aspect of who he is — from his distinguished graying hair to the crow’s feet beside his eyes. @citizencyborg: I don’t see any mention of “aging-related diseases” in [XXXXX]’s caption, just a gesture directed at the human aging process writ large. This is not a frivolous point. There is, in general, a distinction to be made between (on one hand) wanting longer lives and wanting to prevent premature death, and (on the other hand) wanting to abolish entirely the process of aging unto death. To be sure, the distinction between therapy and enhancement is imperfect. But it does shed light on what it means to live warring against your own nature. I didn't see it that way at all. It looks to me, based in the text, like the poster is saying, "Give aging the finger." If the poster was part of an anti-cancer campaign, I suspect you would have applauded its bold pro-life message. Why is an FU to aging and aging-related diseases so distrubing to you? Would it be correct to say that a person who is OK with "wanting longer lives and wanting to prevent premature death" is OK with slowing the aging process? If not, why not? No. Hardly all death is caused by aging and, indeed, it is only because we have been so phenomenally successful over the last few centuries at treating and avoiding preventable death that it is now routine for a person to confront the aging process and consider it a significant problem. These are very practical distinctions: for instance, the difference between, on the one hand, wearing sunscreen to prevent blotching and cancer, and on the other, getting a facial peel or a face lift to counteract the appearance of growing old. If you think preventing premature death is the same thing as slowing aging, then at what point do you draw the line on radical life extension — or do you at all? Doesn't your very use of the term 'premature death' imply that there is and ought to be some natural limit? It is human nature to view ourselves as separate from our bodies. This is the mind/brain duality. We can and do rage against what Dylan Thomas called the "dying of the light". That is human nature. We want one more moment one more good day one more thought or idea. Our bodies work against that wish and it is as if we are at war with ourselves. To find that expression today writ large in the transhumanist movement should not distress you but delight. It is only at this curious time that we could make that struggle with ourselves, our own human nature, a struggle that has a winner other than death. SteveH, you appear to be arguing against the point of this post while actually reinforcing it. You personalize death as if death could somehow be a winner. You emphasize and appear to glorify an incoherent "struggle with ourselves." And while Transhumanists say they strive to escape human nature, you seem to be using human nature as your justification! I suspect you and I share an overwhelming portion of values in common. I too want to continue to develop and expand the sphere of human values and instrumentality, but I would offer that actual progress will be made in the here and now, working with constraints rather than escaping or overcoming them, promoting an increasing context of increasingly coherent, hierarchical, fine-grained, present but evolving values via methods increasingly effective, in principle, over increasing scope of interaction. To the extent that Transhumanists fixate on an imagined future within an unimaginable context, the achievement of stated but inadequately specifiable goals rather than the promotion of present and evolving values, and reification of "rationality" as if applying the rules to win within a video game, well, they get in the way of real progress. My use of the term "permature death" was simply quoting you without the quotation marks. And to quote you again, it seems to you to mean, "there is and ought to be some natural limit." Is there? Is there such a thing as mature death, as opposed to premature death? What on earth might it look like and what would it's characteristics be? And if there is, can it's characteristics be used to rationally make the case that it "ought" (sez who, exactly?) to be so? There is, in general, a distinction to be made between (on one hand) wanting longer lives and wanting to prevent premature death, and (on the other hand) wanting to abolish entirely the process of aging unto death. Why should I consider any such distinction? Aging is a disease, plain and simple. I see no reason to consider aging to any more a part of my self-identity that I would cancer or HIV, if I were to have these things. I define any biological process that reduces the functionality of my mind and body to be a disease. I see no reason to think any different about this. Ari and Kurt have both used the phrase "premature death" and I request a clear definition of the term, please. Also, since 'premature' is a qualifier, I request a definition of what the other kind of death (the kind that is not premature) is and what it's characteristics are. Thanks very much. The advent of effective anti-aging medicine makes the distinction of "pre-mature" and "mature" death meaningless. Death is death, period. Ari - I assume you disagree with what Kurt says above. Can you give us your definition of the term "premature death" please. Also, since 'premature' is a qualifier, how about providing your definition of the kind of death that is not premature. Thanks very much. Well, why on earth shouldn't we resent it? It's horrible. It holds us back from everything we would accomplish. It makes us miserable. One would have to be literally insane not to resent something that causes so much suffering. Ari - Still no definition from you of "premature death" and the other kind. I submit that if you can't come close to making the distinction in plain English, the distinction you try to make in the arguments you present may not, in fact, exist. @The Boss: The comments section of a blog is not the ideal venue for the kind of careful discussion that this complex subject merits. And complex it is: While Kurt9 claims that it is simple — "Death is death, period," he says — he surely wouldn't say that there are no distinctions between different types of death, would he? At the very least, Kurt9 would recognize a vast moral difference between death by murder, death in an accidental car wreck, and death by suicide. I suspect that Kurt9, as a libertarian, thinks that any death unwilled by the dying person is premature, but he probably has less of a moral problem with death that is willed by the dying person. I used 'premature death' in the colloquial sense, the one that ordinary people would recognize, the one acknowledged in how most people mourn. In that everyday sense, 'premature death' means dying before the time that is typically regarded as the age that most people die (nowadays, about 80). There is a difference between dying at a young age and dying at an old age: In the former case, a human being is deprived of many more of the experiences of life than in the latter — and not just many more years of the same experiences, but of qualitatively different experiences (like getting to raise a family). It does not necessarily follow from this distinction that one sort of death is bad while the other is not. It is possible to recognize factual and moral distinctions between different ways of dying, maintaining that some are worse than others, while still saying they are all ultimately death and thus, in a sense, all regrettable. But to claim, as Kurt9 does, that they are all morally equivalent is sheer hokum. To get back to my original point, there is a clear distinction between (on one hand) wanting to live longer or prevent premature death, and (on the other) wanting to abolish altogether the aging process. Staying healthy and fighting disease, for example, can be done without distorting the course of a life. But aging is in and of itself a part of the course of life. It can be accepted with dignity — graying hair, wrinkling skin, and a slower pace than the restless energy of youth. Or it can be resisted by those who live in an ever-growing sense of crisis about their loss of youth by affecting the attitudes of the young and attempting to stave off the manifestations of aging through plastic surgery and other extreme measures. The distinction between disease and aging is an obvious one, widely acknowledged in biology and medicine as well as everyday usage. Merriam-Webster defines 'disease' as "a condition of the living animal or plant body or of one of its parts that impairs normal functioning and is typically manifested by distinguishing signs and symptoms." Part of 'normal functioning' is the rise and decline of that functioning. We spend perhaps the first twenty years of our lives in a state of reduced mental and physical function relative to our highest potential, and we likewise spend our final years in a state of gradual decline from our highest functioning. Neither childhood nor senescence is considered a disease; each is part of the normal path of functional ability over the course of a life. It is necessary to dwell on this point because of transhumanists' common claim that there is no difference between disease and aging. You can see this, again, in Kurt9's comments above: "Aging is a disease, plain and simple.... I define any biological process that reduces the functionality of my mind and body to be a disease." The other day on this blog, Charles Rubin mentioned Humpty Dumpty from Through the Looking-Glass, the character who memorably said "When I use a word, it means just what I choose it to mean — neither more nor less." That's the kind of game that Kurt9 is playing here, trying to make words mean only what he wants them to, not what they are normally understood to mean. To be sure, as nutrition, sanitation, and medicine have evolved, we have come to have different expectations for 'normal functioning.' We have different expectations for the length of our lives and for the highest reaches of human functioning. But to claim that aging is a disease is to radically redefine normal — in fact, to reject normalcy as we understand it. Of course, this is the whole point. But such a rejection requires a stance that human biology as it exists now is inherently diseased. In this redefined world, disease is not a disruption from normalcy; disease is normalcy and normalcy is disease. There are myriad problems with such a stance. For one, it might be used to justify overriding our ethical bearings in the pursuit of any means necessary to cure our condition. But the attitude also radically distorts and degrades our experience of life as we now know it. The normal shape of rise and decline over a lifetime, each phase with its own peculiar agonies and joys, gives way to a wrenching war against the self. If the human condition is one that is inherently diseased, it must also be (as another commenter has suggested) inherently miserable. We must come to occupy ourselves not with living and appreciating the lives we have while working to make them longer, but instead with a frantic scrambling after youth that by its very nature is insatiable. When we believe that we are always suffering from a terminal disease, we will come to live our lives as if we really are. I fail to see what is so important in having your body age and eventually break. Through history, we have influenced our expected lifespan. It started near 20 years old and now is up to 80. When we started using crops or tame animals, did we do it against human nature? What happened to the good old hunting and berry-collecting? What about drugs and other medecine? Is an open-heart surgery a bold gesture toward human nature? And wait.. what about Gene Therapy? Should we tell all cancer patients that they should just let go and die? All this seems fatalist to me. All these, hacked, in some way, your expected lifespan. I don't understand how, now, we should just sit and comptemplate on what we've achieved. I'm 24. Personally, I would prefer growing up without breaking. You will have a lot of trouble selling me that my time is up, that now I must let me wither and die. I want to continue to learn, I want to continue to love and experience the good things that life gives us. I want to see my children and their children grow up. I want to continue having good moments with my wife. Seeing her age, suffer and eventually die will never be a good thing. Seeing her loosing hope, remembering the old days and crying for them to come back. It's not something anyone want to see. Should we just age and come to accept that our time are done? To me, it feel like suicide. Litterally. The problem is that we never defined what was human nature. When did it start? I mean, it always evolved. In 1900, it was different than what we have now, wasn't it? Shouldn't it continue to evolve? the human experience (nurture not nature!) includes lots of problems. We won't know if ageing is a feature or a bug until after it's defeated. Until then, it causes lots of problems, much greater than the current unknown costs. It's hard for me to understand how you don't see the obvious difference in trade offs here. There will be some very minor tweaks to our genes but that is very small compared to the changes that have occured simply by being born in the 21st century. It is you hating human nature Ari - you hate those changes that resulted in anything that lifted us from the squallor of the middle ages and the desolution of the late ice age. 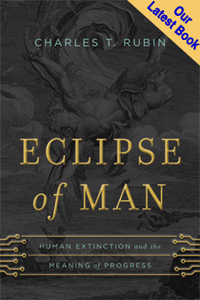 Human nature is about something not seen on this planet ever before, and this project is not over. I say, screw influenza, screw acne, screw the black plague, screw mosquito's, screw floods, screw volcano's - and screw the malignant disinterest that is nature. We can fix this and we will fix this. Your alienation 'with all this confusing change' is costing us time. In the month progress denialists cost us, many many people will too soon. And no we won't live forever. But merely doubling the quotum will be like a renaissance ten times over. See, here's the problem. So long as the "transhumanist movement" is actually a personality cult, and the personality at the center of the cult is "combative," then the transhumanist movement writ large will inevitably be perceived as combative. Let's see if anybody in the "movement" emerges who can approach public speaking with a little more tact and a little less self-aggrandizement. I am not, however, too hopeful.